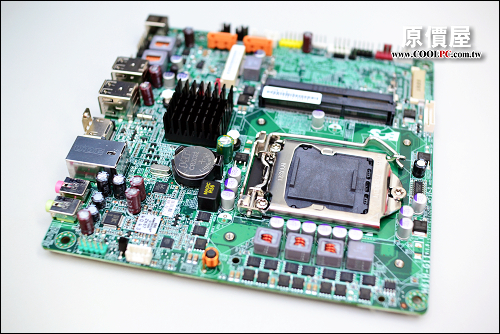 Great review of the Intel DH61AG Media Series Mini-ITX motherboard over at Missing Remote. Comes with DC-DC PSU - just add a 19V brick. Idles at 15W. My DH61AG came this afternoon. I've been waiting for something like this ever since SPCR's Intel D945GSEJT review a couple of years ago. The goal of having an extremely low power desktop that is also very fast (I run a lot of compilers/development tools) is an obsession for me. I'm not going to get around to messing with it much until this weekend, but here are my observations so far. 3) With default settings the stock HSF is not silent. It is quiet, just not silent. 4) One nice touch which I wasn't expecting in the box was a SATA power cable which you need because you power your drives directly off the motherboard. 6) I have a Dell Inspiron 17R (the current second generation Sandy Bridge model) and I'm using the 17R's power supply to power the DH61AG. So I can confirm that the Dell power supplies have the right barrel connector to mate with the DH61AG. The spec for the Dell (barrel) is 7.4mm outer diameter, 5mm inner diameter. That was my biggest worry when making this purchase, so I'm really happy that it worked out. 7) This combination of components (with the Samsung 470 SSD) flies, after the BIOS boot screen you get to the Ubuntu desktop in about 2 seconds (if that). My Dell 17R (Core i5 2410M, 4GB DDR3 1333 w/2 DIMMs, 500GB 5400RPM notebook drive) idles at 8-9W with the screen off while driving a 1920 x 1200 monitor via HDMI. It is a good comparison because it is of the same second generation Sandy Bridge architecture and I'm using the same DC power supply. So while the DH61AG is a more laptop-like design (single DC power in, DC-DC conversion directly on motherboard) than a normal desktop PC, actual power use is between a normal desktop and a laptop. BTW, after I got my 17R for home I got a couple Vostro 3750s at work. They are essentially the same laptop in different cases. The 3750 also has a fingerprint sensor, gigabit ENET (instead of 10/100 on the 17R) and an ExpressCard slot. But the biggest difference for me is that 3750 has a screwed in panel so you can get to the hard drive easily while on the 17R you have to basically have to disassembly your entire laptop to swap hard drives. It's crazy, you can see the hard drive on the 17R through its ventillation holes but you can't get to it. So while the DH61AG is a more laptop-like design (single DC power in, DC-DC conversion directly on motherboard) than a normal desktop PC, actual power use is between a normal desktop and a laptop. I'd say its power consumption is clearly desktop-like, as one would expect since it uses desktop parts. It seems a bit high even. Others have similar builds which idle at about 15W. I don't think their power supply are that much better than yours or you wouldn't get 8-9W on your laptop. I agree, I think that a combination of any of the reasonably power efficient H61/H67 "normal" MicroATX motherboards with integrated graphics, a reasonably efficient PSU and a SSD gets me into the 22-25W range at the wall easy. But my desktop Core i7 860 with a 3.5" WD10EADS hard drive and Nvidia G210 graphics card idles around 42W (with a Seasonic X-400 fanless PSU) isn't that much more and has absolutely no limitations. This is where my frustration with trying to get fast a low power (<10W) desktop system comes from. I'm spending a lot trying to get best of breed components, and in the end I'm just not getting there. The Sandy Bridge laptops turn out to be a really good balance of performance and power. The 17R's 8-9W idle (14W with the 17" display on at mid-level brightness) is actually under that of my Acer Timeline 4810 ultraportable. This DH61AG experiment does answer a major question for me though. It all started about 5 years ago, I had a need for 8 PCs in a single place and was trying to minimize the heat load of them all being on at the same time. I bought a Compaq V2000 laptop (1.4GHz Pentium III generation) and it idled at around 17W, 35W at full load. I also had a desktop MicroATX 1.0GHz Pentium III system with a 300W Seasonic Super Tornado that idled at 30W. At the time, HP started their Slimline product line which had exactly the same CPU and limited expandability, almost like a laptop. So I bought a bunch of Slimlines thinking "how much more power could they possibly use". It was shocking, a lot more. 50W idle, 70W+ full load. The HP Slimline had a normal 200-250W SFX PSU that just wasn't tailored to low loads. The Slimlines got returned the next day and I still run that system with 8 Compaq V2000 laptops. The Slimline's PSU couldn't possibly account for the whole difference though, it has to be the whole power supply architecture and that is what I thought the DH61AG would fix for me. I'm pretty sure that the reason the DH61AG isn't getting me all the way to the sub 10W idle of a laptop or the Atom based D945GSEJT is because the DH61AG is actually designed to handle about 100W of power output and my idle scenario isn't in its sweet spot. It can deliver up to 25W to the PCIe connector, powers two SATA hard drives and also powers the two mini-PCIe slots. The laptop and the D945GSEJT can target something more like 45W max output. So if you take the 18W I got and look at the 15W MissingRemote saw I can easily see the 3W difference coming from the choice of a different processor (they used a Core i5 2390T while I used a G620) and a different laptop power adapter. Now, the 17R laptop is also using a mobile processor that idles at a lower point than the desktop processors and a mobile chipset that might run at a lower voltage. But I think the remaining ~5W difference which I wasn't expecting comes from the fact that the DH61AG has to power all of that extra possible functionality. If I really wanted a sub 10W idle, they would have to come up with a different versions with lower functionality. That said, the form factor of the DH61AG is awesome and that alone makes it worth it. The one that I got is destined for a Windows Home Server 2011 system. But I'll probably be getting more DH61AGs for use as test PCs. I can put a lot of them in a really small space. Would be intresting if a manufacturer decides to release a laptop chipset for htpc, like it happen with Zotac Intel Celeron SU2300 1.2GHz Dual-Core Mini ITX Intel Motherboard IONITX-P-E, but with the new sandy bridge mobile low voltage cpus like Intel® Core™ i7-2617M Processor. Outside of OEM builds (Apple, HP, Zotac and so forth) you can't buy parts for at reasonable prices, it seems this market has been abandonned to Atom and now Fusion boards. Laptop gear is so expensive compared to them! How long will we have to wait for someone to sell ARM boards? see ASRock CoreHT and Fujitsu ESPRIMO Q900. How long will we have to wait for someone to sell ARM boards? Trim-Slice by Compulab (Fit-PC) is already on sale, although it's a complete Arm 9 Cortex + Tegra 2 system, not just a motherboard. Thanks for the link, but those seem like normal Sandy bridge Core i mobile series, not the low voltage, either way its interesting. maybe the next Mac Mini? OEM systems are nothing new. It's parts we lack. Not only are there very few mobile boards (and no modern ones as far as I know) on the market but I've never seen an ULV (or similar low-power versions of the main AMD line) sold in a regular retail outlet. Yeah, I'd like to buy an ARM board, not a fancy system which forces me to use USB for I/O. Other manufacturers are already on the case, e.g. Gigabyte MSH61PI. MSI already produces the IM-945GSE-A, similar to the Intel D945GSEJT. I'm guessing Thunderbolt is extremely likely, gotta sell more of those $50 cables! Mac Mini refresh might be sooner than later. After installing Windows 7 (64-bit, Home Premium) instead of Ubuntu 10.04, idle power dropped to 14W. 2 cores loaded with the PovRay benchmark max power is 39W. With one core disabled in the Intel BIOS, max power is 27W with the PovRay benchmark. With one core disabled, this system seems to run fine fanless with the Intel HSF mounted but the fan unplugged. Max temp in this configuration is around 72C. Is this a load temp without any fan? Suprising. If you're willing to test at those temps (probably higher than Intel's specs and possibly dangerous for the mobo if there's no other fan), could you see if there's automatic throttling under load (which could be the reason why temps don't shoot up too high)? It'd also be interesting to see how much you need to underclock to get the temps you got by disabling a core. It didn't look like it was throttling with one core, CPUID showed 2.6GHz the whole time. But if it wasn't, it was probably close to the edge. It actually took a while (> 10 minutes) to get to max temp, it just ticked up slowly. It was just an experiment, I typically don't run fanless. Arctic Cooling 120mm fans at 5V or some of the lower RPM SilenX fans do the job for me (can't hear them unless my head is right up to them). I figured how to get the DH61AG into my Raidmax ITX-0907-BP Mini-ITX case. If I take a Rosewill RCX-Z90-CP HSF and remove the fan everything has pretty good clearance. Then I'll have an Arctic Cooling F12 at 5V to move some air. Throttling (at least initially) uses P-states. You won't be able to see the frequency drop (because it doesn't) but the processor just does nothing some percentage of each million cycles or so. The only way to assess whether the processor is actually throttling is by observing temperatures and/or performance during these events. Still 13W idle, so no improvement there. As always with Apple, RAM upgrades are a staggering rip off (in the UK £80 for extra 2GB vs £37 if you source your own pair of 4GB SODIMMs) Macbook Air Superdrive is pricey as well, but maybe you can just use any external USB optical player. At first glance it looks the same as always, very neat, efficient design that's strongly appealing, but probably can get much better value elsewhere. I did some further testing and I'm pretty sure that it isn't throttling in the fanless 1 CPU test case (its performance does seem constant) but after playing with it for a couple of hours I don't think that trying to run it fanless is a good idea. Even in my open air benchtop environment there is just a little too much heat coming off of it at load to make anything fanless seem like a good idea. My Rosewill RCX-Z90-CP HSF came in and I was impressed. Its inner core is copper and its pin retention mechanism is awesome. Just a gentle push down, then you hear the pin click into place. I normally go through a thumb battle with the stock Intel HSF on every build and still have to check underneath to make sure the pins are seated correctly. It was just way smooth/easy. Removing the fan did get the DH61AG into my Raidmax ITX-0907-BP case and with an Arctic Cooling F12 inside at 5V the system runs great. The combination of the Rosewill heatsink and Arctic cooling fan worked so well that I just placed an order for 3 more of each. Just one more thing... the G620 CPU I'm using with the DH61AG idles at 1.6GHz / 0.96V and ramps to 2.6GHz / 1.12V at full load. The Dell Inspiron 17R was using as a reference (Core i5 2410M, a mobile processor) idles at 800MHz / 0.796V and ramps to 2.9GHz at full load. Anyone know what frequency/voltage the 2390T the Missing Remote guys used idles at? The audio coming out of my DH61AG (rear headphone jack) is shockingly clean. I normally play music through portable MP3 players instead of through my PC because of coupled noise during PC activity or background noise. But the DH61AG is super-clean even with a pair of earbuds, volume control turned up to 100% and all kinds of I/O activity going on. It's hard to put into words, I've never (ever) had a system like this where there was just a complete absense of noise on the audio during periods of silence. I hadn't really noticed before, but I think that the second one (B003ZLTHZK) is an actual Dell brick that happens to be made in China while the first one is a Chinese knockoff. They perform similarly and I haven't had any problems with the first. But there are small physical differences between the two. The second one has DELL embossed into the rubber cord wrap... though I have no idea if that means it actually is a Dell. the DH61AG is super-clean even with a pair of earbuds, volume control turned up to 100% and all kinds of I/O activity going on. have you had other systems previously powered by an external AC-DC PSU? or are you comparing against previous ATX PSU systems and/or laptops? as in same idle & load on your Kill-A-Watt? Nope, this is the only desktop system I've had with a DC input. I have about 25 PCs for business/engineering use (taking care of them is my personal hell). All of the desktops were built from scratch. Most of them actually sound ok with headphones and moderate volume, the larger drivers tend to damp out the noises that bother me. The thing that struck me about the DH61AG is that is sounds good with earbuds that are more sensitive that I know let me hear noise on those other systems. I actually have 3 compatible power bricks. One shipped with my Dell Inspiron 17R, the other two I bought from the links above. I'll get all three of them together and run a quick test this weekend to see if there is any difference. My issue with power bricks isn't efficiency (they seemed to be around the same when I checked before), it is more about wondering if the thing is going to catch on fire after running 24/7 at load. I'm ok with the under 40W I'm seeing with the DH61AG/G620 pair and a 90W brick. Not sure I would want to load it much more though. Great info thanks, may buy this board in the new year but still awaiting the other Intel Thin ITX boards, due Oct/Nov, anyone heard why the delay? ...and also with the ECS H61H-G11 board that seems to be coming through retail below the $70 mark, which makes it a bit of a bargain! but I can't find any details on the ECS site other than it's the board in their G11 All-in-one system. How about a SPCR review...?